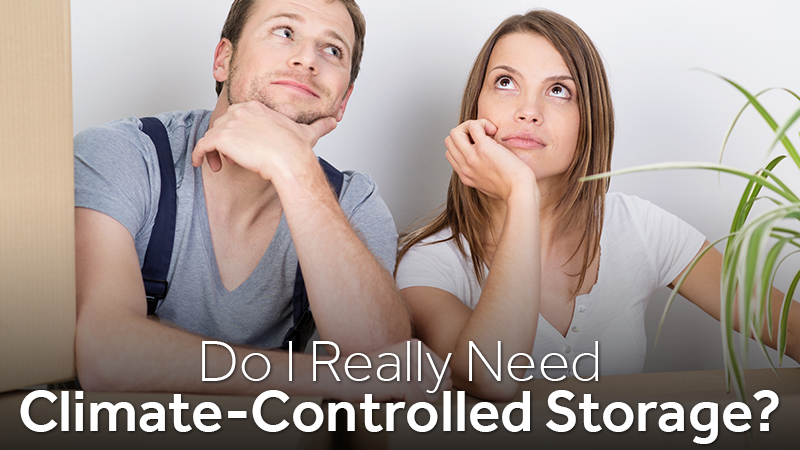 Do I Really Need Climate-Controlled Storage? When considering storage options, one of the most important decisions that must be made involves determining if climate controlled storage is necessary. Everyone wants to save as much of their hard-earned money as possible, and a climate-controlled option is usually more expensive than a traditional storage unit. However, there are a number of benefits to selecting a climate-controlled storage space. In a traditional storage unit, the interior temperature is unregulated. That means that the temperature that your belongings are subjected to will change according to the weather. In some parts of the nation, and depending on the season and the location of the unit itself, that can mean big swings in temperature. 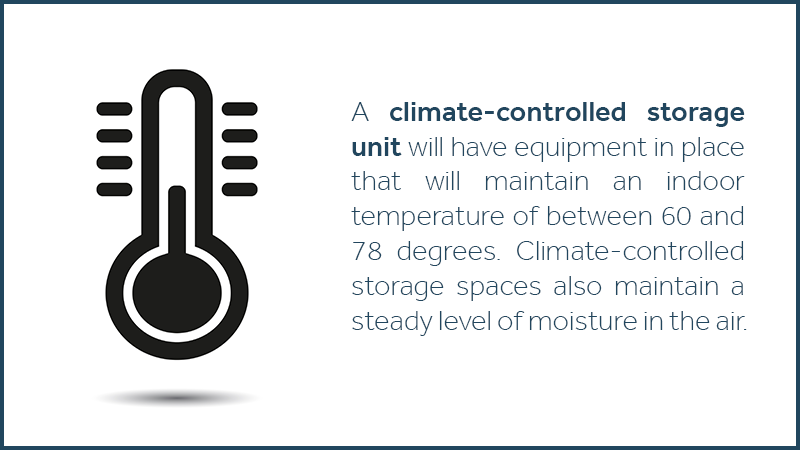 A climate-controlled storage unit has equipment in place that will maintain an indoor temperature between 60 and 78 degrees. Climate-controlled storage spaces also maintain a steady level of moisture in the air. When is Climate-Controlled Storage Necessary? The primary means of deciding if climate-controlled storage is the right choice involves assessing the property that will be kept in the unit. Things that are susceptible to damage from moisture, such as electronics, clothing, artwork, wood furniture or leather goods are likely to be safer in an environment where moisture is carefully regulated. The same goes for items that can sustain damage from extreme temperatures. Heat will cause issues with photographs, musical instruments and certain types of machinery. When is Traditional Storage a Good Option? Traditional storage can be a logical solution for some. When moving, for example, having a storage unit to hold belongings for a short period can make a move easier to manage — but why not have the storage delivered to you? Damage is unlikely to occur to standard household items that are stored for just a few weeks or a couple of months but this depends greatly on the season and weather. Traditional storage is also a good fit for things that are not likely to sustain damage from temperature fluctuations or moisture, such as lawn furniture, heavy equipment, tools or a spare vehicle. How to Decide Between Climate-Controlled and Traditional Storage? When determining the best storage option, the first step lies in assessing exactly what will be placed in the unit. Second, it is important to determine how long the items will be stored. From that point, the time of year and weather conditions should be assessed. In Texas, temperature changes as the seasons pass. What might be acceptable in April may not be appropriate in August. We also deliver the storage pod to you and pick it up when you are ready. We can hold onto it for you as long as you need and deliver it to your new home or when you are ready to take some of your items out. You&apos;ll save so much time and we all know how much that is worth. Choosing a climate-controlled storage unit may not be as expensive as you imagine. At Zippy Shell West Houston, we offer different storage and moving options to suit a wide range of needs and budgets. Feel free to give us a call to discuss your particular set of needs and to see if we can find a solution that works for you and your family.